This month Our Daily Bread Designs is releasing 5 stamp sets and Two Exclusive ODBD Custom Dies. You can see all of the September Releases here. Continue reading below to find out how you can win a $50 Gift Certificate to the ODBD Store good towards the purchase of ODBD stamps. To create my card, I used the Little Drummer Boy stamp set and ODBD Custom Fancy Ornaments Die from this release along with the Large Snowflake Background, ODBD Fancy Foliage Die and ODBD Recipe Card and Tags Die. The image is stamped on Vanilla card stock in Coffee Archival and stamped a second time on MME pattern paper so the the image could be paper pieced. To add color, I used STAEDTLER Mars Graphic Markers and sponged the edges with Ranger Gathered Twigs Distress Ink. The Snowflake Background was stamped in Coffee Archival on MME pattern paper. 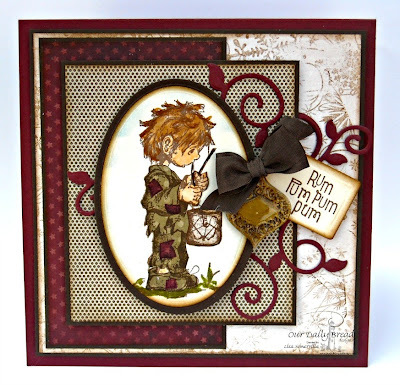 The clouds were added to the background by sponging around the Scallop Ornament from the Fancy Ornaments Die. No more sponging around a cut out scallop paper! To embellish I cut the swirl from the ODBD Fancy Foliage Die from Burgundy card stock multiple times and pieced it to fit my project, and cut one of the Fancy Ornaments from Shrink Plastic and covered it in Gold UTEE using the Melting Pot to add as a charm to my project. The sentiment is stamped in Coffee Archival on a Vanilla tag that was cut/embossed using the tag form the ODBD Recipe Card and Tags Die. I diecut and embossed the Fancy Ornament 6 times cutting from White card stock, then scored down the centers, sponged with Ranger Gathered Twigs Distress Ink and embossed with Ranger Dry Glitter. I adhered the pieces together with Gel Medium, tied on Gold Cording, Red Seam Binding and added some Pinecones to embellish. Kelley will randomly be selecting 1 winner who will receive a $50 gift certificate to Our Daily Bread Designs, good towards the purchase of ODBD stamps, just for commenting on the Design Team cards! You have until Tuesday, September 3, 2013 at 9:00 p.m. EST to leave your comments. The Winner will be posted September 4th, on the Our Daily Bread Designs Blog, so be sure to check back there to see if you are won! Lisa, I love both of your projects! The rich colors of the first reeled me in and the shrink plastic ornament got me!! 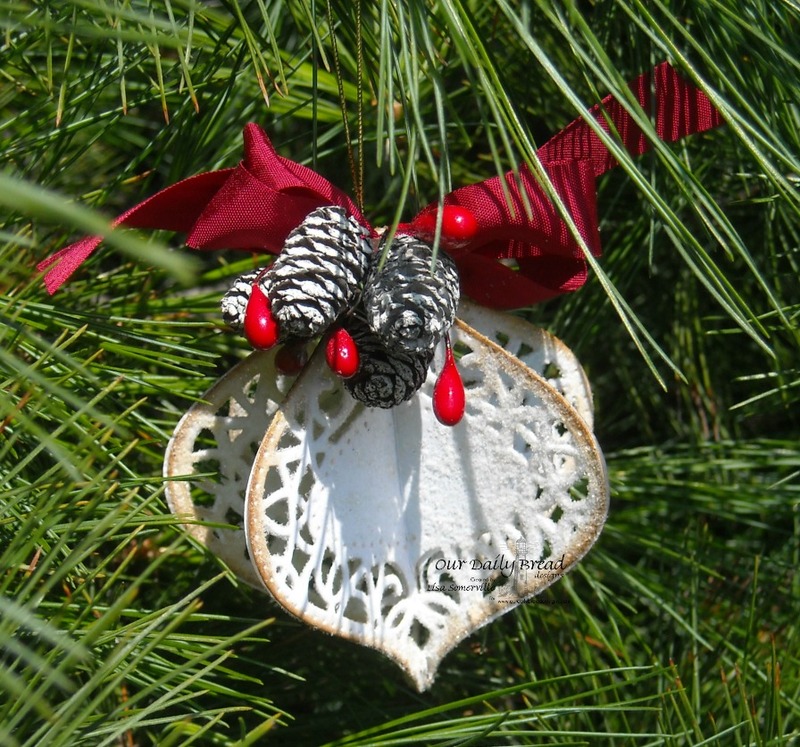 The ornament is so beautiful and looks great with the pine cones!!! HUGS!!! Your drummer boy card is so precious. He is a perfect rendition of what I picture the drummer boy to be-eager to please, yet humble. The ornament is lovely. Lisa - I'm in love with these creations!! Your drummer boy is priceless and the ornament is just amazing!!! Thank you for this wonderful inspiration - this new release has me looking forward to Fall and the Holiday Season that follows. Oh Lisa I love your little precious drummer boy! And that ornament is stunning! Two great projects. The card is so lovely and the shrink art charm is beautiful. The ornament is such a good idea. I have several friends who are new immigrants...think I will try a set of 6 of these as a Christmas gift. When you arrive with one suitcase each, Christmas ornaments are low priority the first couple of years! Love the card and the ornament. Your little drummer boy is just wonderful, Lisa! Love the colors and papers. And your ornament is just lovely. Love that Drummer boy with your beautiful coloring and layout with all of the detailing. The ornament is fabulous as well and will make a lovely keepsake. I love the coloring of the drummer boy and how he is the focal point of the card--so pretty! I just love your 3-d ornament! I really need to try to make something like that. You have amazing talent! Wonderful ornament! It looks amazing! Your drummer boy card is fantastic! Love how you created the ornament charm! TFS God bless!! What a sweet card! I love the burgundy and the pop of gold! Your Little Drummer Boy is so beautiful. Looks like a lot of work was put into the card. It's gorgeous! Love that sweet drummer boy so Lisa! And what a clever idea for ornaments! This will make some wonderful gifts for the holidays! Thanks for inspiring me! The little drummer boy is so amazing! The colors & layout is just perfect. The added gold ornament tops it off!! I will have to try the 3-D ornaments, that is just really sweet. love the little shrinky ornament! great tip on the clouds too! Adorable, he is so cute that drummer boy! Beautiful card, great use of colors....great 3D ornament too! Both of these are so pretty. I really like the ornament you created. It is so lovely!! Your projects are breath-taking! Thanks for the clever tip on cloud sponging! Love the details of your drummer boy! Rich in colors and textures! The ornament is awesome-ness! Such beautiful projects! Love them both, but I really love the delicacy of the ornaments on both card and as a stand along ornament! Beautifully done! Love the little drummer boy. He's exactly like I would have imagined. Your creativity has been loosed again with this release, Lisa! Your drummer boy is just precious...the shrink plastic ornament is a stroke of genius! How gorgeous is that 3-D ornament decoration! Won't these look just stunning on the Christmas tree? Thanks so much for sharing your creativity! Hugs! Oh I love that you used shrink plastic for your ornament charm Lisa! It's so pretty and the perfect embellishment! Love the paper piecing of the little drummer boy, and the ornament is pretty too! Using the ornament die to sponge clouds was just a great idea! So clever and creative!!! Wow, I really like your drummer boy card. 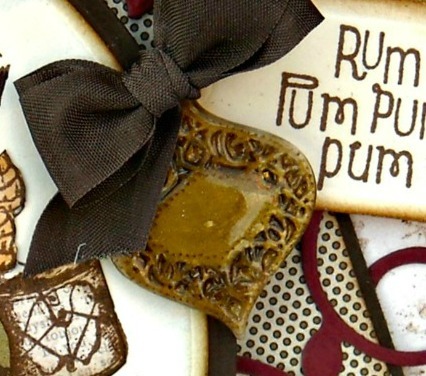 The rich colors & layers and especially the ornament charm you made with the shrink plastic!! What a fun die cut tree ornament, I like your use of the dry glitter on it. Love the rich colors of the drummer boy card and the ornament is gorgeous. Lovely card and ornament! Drummer boy is definitely on my wishlist. Great coloring and layout on the card and gorgeous ornament. Okay, that's it...that ornie die is a must have! Both projects are so cool. Your creativity is very inspiring to me. I've got to schedule some time to be creative! Thanks. Love the rich look of your creations!! cute little drummer boy and love how you used the ornament die on the card with the ribbon!, neat idea making a 3-d ornament too! Love your little drummer boy! He definitely holds a special place in my heart... the ornament is fabulous, as well! Thanks for sharing with us! Oh your drummer boy is too sweet Lisa and your ornament with the dies is so elegant and beautiful!! What a creative use of the ornament for sponging!! love that ornament!!! gorgeous!! love the card too! that image is darling, great tip with the inking around the die. 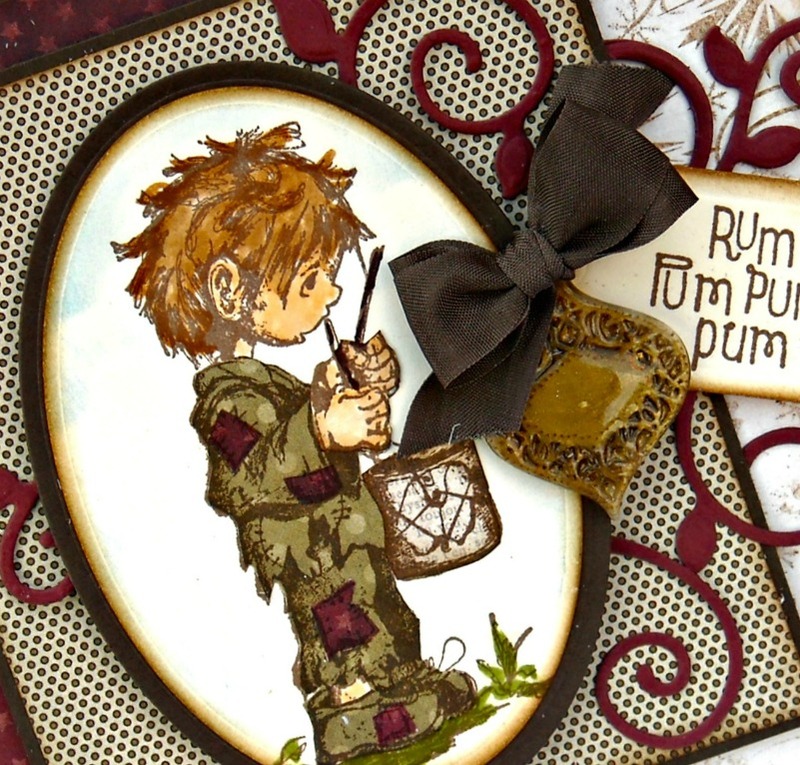 Love that sweet Drummer Boy card and your beautiful ornament! I love how you have shown off this adorable Drummer Boy with the different layers and deep burgancy. The ornament is so elegant looking. CUTE drummer boy card!! What color did you sponge the sky with? The ornament is so cool. I was thinking it would make a great class project until I read you had to cut it out 6 times..LOL! Your little drummer boy is darling. The ornament is incredible... These dies are definitely on my list. Your card is perfect. The coloring on the drummer boy is wonderful. Love the ornament. Love the rich colors on the first Lisa!! Beautiful!! And your ornament is so charming and gorgeous!! Love that wonderful ornament you made! So beautiful on the tree. The ornament is simply beautiful! I'd love to make a few like that for our tree - or as gifts. And gosh, doesn't the die work so well for sponging clouds. You sure worked those dies to get amazing varied effects. The little charm is just dinky!! Reminds me of some gold wax ornaments we once had. Awww...the drummer boy is too cute Lisa! 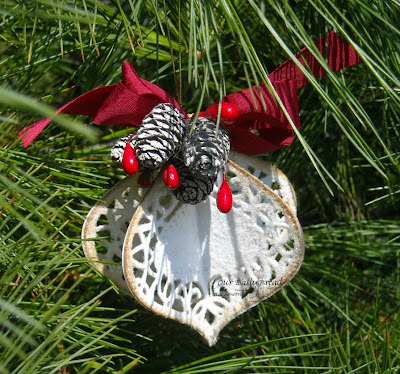 Your ornament is beautiful and perfect for the upcoming holidays!